SquareSpace Review: Is It A Good Website Platform? SquareSpace is one of those website builders that wants to be the ‘cool kid on the block.’ And you know what, it doesn’t do a bad job of achieving that. In this SquareSpace Review, we look at how SquareSpace performs as a content management system. SquareSpace is an online only website builder. This means there’s no open-source software where you can download the core programming and customize it for your needs. The biggest advantage of this is that you don’t need to be a coder in order to use SquareSpace. The disadvantage is that you are stuck with the themes and customization options SquareSpace offers you. The first thing you will notice about SquareSpace is the clean, professional look of the homepage. It is a pleasant sight and it draws you in with its awesome, fresh, and perfect look. Of course looks can be deceptive, so you do have to go further into the builder to see if it’s worth the cost. These are great little additions that can make all the difference to your website. You won’t just be able to put together a functional website, but you will be able to develop a website that’ll impress your visitors. However, the important issue when it comes to a website builder is the usability. Because it’s a web based builder, the coding needed to make changes is minimal, and that’s great. The latest version also has a live content edit mode, allowing you to see how your pages will look as you make changes. This frees up a lot of time from saving changes, looking at the preview page (or live page) and then going back to make minor adjustments. SquareSpace like to consider themselves as the best website builder for professional bloggers, portfolio sites and ecommerce websites. Some of this might be true, but there are some points to mention. Firstly, ecommerce store capability isn’t available on the lowest price point. In addition, at the business level, the lowest cost pricing tier where ecommerce is allowed, you must pay a 3% transaction fee. These restrictions, with the costs of the higher pricing points, may put some users off. The themes on SquareSpace are impressive, and unlike with other website builders, there are a decent number of them you can get for free. You can also select from over one thousand fonts to give your site a unique look. The only problem is that these themes don’t work so well if you don’t have professional photos. So be sure to have those. Functionality on SquareSpace is pretty good, as long as you are willing to pay for it. The personal plan lacks a lot of options you get with the higher pricing points. For instance, the following functionality is not available in the personal plan. You can’t capture email addresses and put them into your MailChimp list. Nor can you use Zapier to send email subscription details to another email marketing tool. There are no promotional pop-ups. These can be very useful in increasing revenue per visitor and raising subscription rates. You can’t add an announcement bar. This is something that’s a little problematic as you need announcements to comply with regulations across the world like cookie consent. Therefore, it’s likely that if you want to build a professional website, you’ll be looking for something a little more than the Personal Plan. However, these higher priced plans do come with some great features. Firstly, you can enable accelerated mobile ages so your site performs better on mobiles. This can be an important part of your website’s search engine rank. Another cool feature of SquareSpace is the video backgrounds design feature. This can be the crowning aspect of your website and give it a stunning finish. You don’t even need to upload a video to create a looped video background. Instead, you just need the YouTube or Vimeo URL for the video. Of course there are areas which could be improved, such as being able to select points where the video starts and ends, so certain aspects which aren’t suitable for website video backgrounds such as large logos or credits. 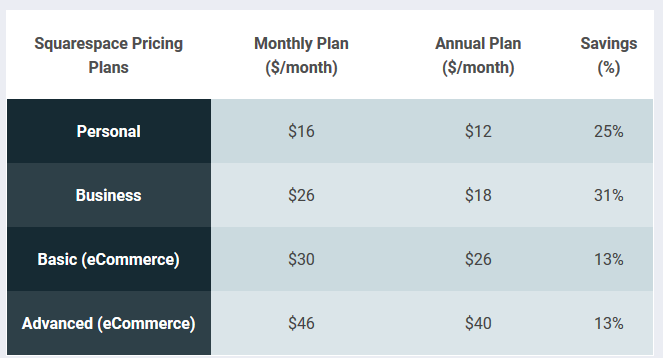 There are four pricing tiers for SquareSpace. These four pricing levels, as we’ve mentioned before, come with different features. The first tier is the personal level. It will cost you $12 per month on the annual plan, plus taxes. You won’t get much for it but you will get support that only a few other CMS programs offer. In addition, on the annual plan, you’ll also get a domain. On the second tier you can create an online shop, but will have to pay a 3% transaction fee. You’ll also have a professional email address and Google Ads credits. This will cost you $18 per month. The third tier is $26 per month. You won’t have to pay transaction fees, which makes it a great option for businesses planning to not sell any more than $500 worth of products per month. You can also customize your website. The final tier is the most expensive but it offers some great features such as cart abandonment recovery. This is worth $40 per month. You can make a really beautiful website with SquareSpace and it will function well. You don’t need developer skills to get your site looking good, but as we’ve pointed out in this SquareSpace review, it can be costly to get all the features you need for your website.